After all that chocolate last week, I wanted to make a fruit based cake instead. I was recently given this recipe by a friend who had attended a cooking school. She told me that the cake is simple to make especially when you have a stand mixer. As usual, during the course of making the cake, some slight variations were made to the recipe. I reduced the butter used for sauteing the apples as 50grams was too much for me. Instead, I used about 2 tbsps of butter. I opted to use cinnamon as nothing complements apples better. I used a 7 inches square tin which I greased and lined with greaseproof paper. The butter and other ingredients were all at room temperature. Note that butter should not be too soft as it will affect the texture of your cake. Test the butter by pressing your finger into the softened butter, if it leaves an indentation but retains its shape, it is ready to be used. For the apples; peel and core apples and cut them into 1 cm thick wedges. Melt butter (I used less than 50grams to to saute them) in a large non stick frying pan and when it starts to sizzle, add apple slices and stir around the butter. Sprinkle sugar and cinnamon over apples and continue to cook over fairly high heat to evaporate off any liquid and encourage sugar to carmelize around apple edges. Take pan off the heat and transfer apples to a plate to cool. For the cake; grease the sides and line the base of a 20-22 cm round or a 19-21 cm square tin. Preheat the oven to 160C/170C. Cream butter and sugar together until light and fluffy. Add eggs and vanilla extract gradually, beating until mixture is smooth and glossy. Using a spatula, fold in the flour in three batches, alternating with the milk. Do not overstir or overbeat the mixture. Spread about half the batter into the base of the prepared tin and arrange a layer of apples over this. 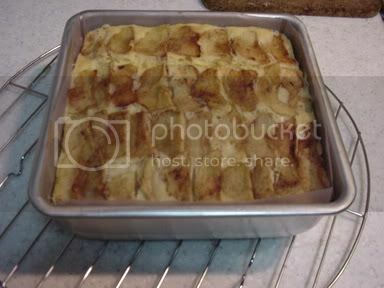 Top with remaining batter, level top and arrange the remaining apples attractively on top. Bake in preheated oven for 35-40 minutes or until well risen and the skewer test comes out clean. Cool cake in tin for 10 minutes before turning out to cool on a wire rack. The verdict of the cake between Splashie Boy and I was it was nice and not too sweet. Splashie Boy reckons that it will taste even better if served with custard. This recipe is a keeper since it's so simple to make and not too sweet. Besides apples, I reckon you can vary the fruit used. I was feeling a little naughty and decided to indulge in some good old chocolate. There is so many chocolate cakes out there but this one called to me to try it as it looked so tall and impressive in Nigella Lawson's cookbook, Nigella Bites. As the recipe called for the best bittersweet chocolate, I scouted high and low for some around town. The regular bake shops seem to have no couverture dark chocolate stock and none of them could advise me of the actual cocoa mass of the chocolate they sold. So I turned to the supermarkets and found Lindt Extra Dark 70% Chocolate Bar and Droste Extra Bittersweet 72% Chocolate Pastilles. I decided to go for the Droste since most recipes always call for Dutch Chocolate. As advised by Nigella in her recipe, she uses a stand mixer and in her case, her Kitchen-Aid, so I had to dig out the old Kenwood Mixer from the cupboard to do it's job. It made things extremely easy since I could measure and weight my ingredients while mixing the batter. Using a freestanding or handheld electric mixer, beat together the melted butter and corn oil until just blended (you'll need another large bowl for this if using the hand whisk; the freestanding mixer comes with its own bowl), then beat in the water. Add the dry ingredients all at once and mix together on a slow speed. Add the egg mixture, and mix again until everything is blended and then pour into the prepared tins. Bake the cakes for 50-55 minutes, or until a cake-tester comes out clean. Cool the cakes in their tins on a wire rack for 15 minutes, and then turn the cakes out onto the rack to cool completely. To make the icing, melt the chocolate in the microwave for 2-3 minutes on medium should do it or in a bowl sitting over a pan of simmering water, and let cool slightly. In another bowl, beat the butter until it's soft and creamy (again, I use the Kitchen Aid) and then add the sieved icing sugar and beat again until everything's light and fluffy. I know sieving is a pain, the one job in the kitchen I really hate, but you have to do it or the icing will be unsoothingly lumpy. Then gently add the vanilla and chocolate and mix together until everything is glossy and smooth. This is the end result of my efforts, not perfect but very edible. I loved the fudge icing as the bittersweetness of the chocolate complemented perfectly with the icing sugar so it did not feel so sweet. The cake is extremely tall and I had some slight problems icing and storing it. The cake was not too rich so it was a perfect foil for the very chocolatey topping. 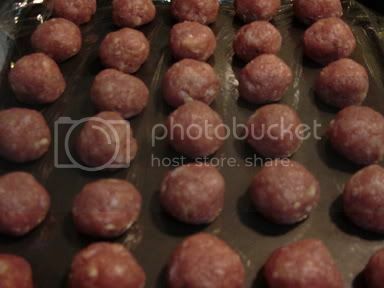 Kicking off my culinary capers in the kitchen, I tried my hand in mixing up a large batch of meatballs. I've always viewed the making of meatballs a bit of a pain as it involved quite a bit of work. However they're a firm favourite of my boyfriend, Splashie Boy and since I have started my blog, I plunged into all that minced meat. 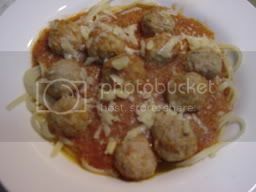 Although there a variety of ways you can mix up the meatballs ranging from the Swedish ones to even Chinese beef balls, I wanted the traditional Italian American ones that are served with tomato sauce and spaghetti. I chose to go with Nigella Lawson's recipe in her Nigella Bites cookbook as reviews indicated it was simple and divine. Just put everything in a large bowl and then, using your hands, mix to combine before shaping into small balls. Place the meatballs on baking sheets or plates lined with plastic wrap and put each in the refrigerator as you finish them. Put the onion, garlic and oregano into the processor and blitz to a pulp. Heat the butter and oil in a deep, wide pan and then scrape the onion-garlic mix into it and cook over low to medium heat for about 10 minutes. Don't let the mixture catch; just let it become soft. Add the tomatoes and then add about 3/4 cup of cold water to the pan with the pinch of sugar and some salt and pepper and cook for about 10 minutes. The tomato sauce will appear thin at this stage, but don't worry, as it will thicken a little later. Stir in the milk and then drop the meatballs in one by one. Don't stir the pan until the meatballs have turned from pink to brown, as you don't want to break them up. Cook everything for about 20 minutes, with the lid only partially covering it. At the end of cooking time, check the seasoning, as you may want more salt and a grind or two more of pepper. Here you have all the meatball mixture in a bowl ready to be mixed. The minced meat has covered most of the ingredients but you can see the egg on top. I whisked the egg to break it up so it's easier to mix it in. After some mixing which was done lightly as possible with the fingertips, I made them in small balls. Don't they look cute in their little rows kinda like soldiers. After that I plonked them in the fridge while I made the tomato sauce. I made a slight variation to the tomato sauce and threw in a stick of celery to the onion mixture to be blitzed. As I had no passata on hand, I blitzed a can of whole plum tomatoes to liquidise them. 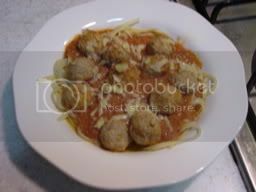 What I love about this recipe is it calls to simmer the meatballs which is much healthier than frying them in the oil. However, this makes them a bit pale instead of the usual brown meatballs. As there was no spaghetti in the larder, we made do with linguine instead. Once everything was ladled in, I sprinkled some freshly grated parmesan on top. We had loads of leftovers as the recipe was for six people but that meant opportunities to use the meatballs for a variety of meals such as a meatball sub ala subway style with ciabatta bread or even meatballs with baked potatoes. Finally took the plunge and registered myself for a blog after agonising about it. It feels kinda strange and am slowly trying to acclimatise myself to writing up my thoughts and things of interest to people so I don't clog up the net with frivolous stuff. Primarily, this blog will cover my culinary efforts in the kitchen which best can be described as grown up "masak-masak" since I've not been trained by any professional chef or baker. Cooking for me is entirely from deciphering cookbooks. Occasionally, my mother will throw in some advice from her many years of cooking. Besides the cooking aspect, the blog will cover everything else I'm interested in and that's happening in my life.